Charity Meal Makers are using food to help combat isolation amongst older people. 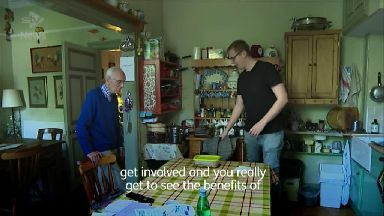 Elderly people in Scotland are being given home cooked meals by strangers to tackle food poverty and social isolation. The charity Meal Makers asks volunteers to cook an extra portion of their meal and share it with an older neighbour to help them live independently. Russell Howgarth, 23, a second-year social work student in Edinburgh signed up to the scheme. She said: "The meal is almost secondary part of it. The main benefit that they get from this is the social interaction that they often don't get stuck in the house." This week's food delivery is for 89-year-old Stig Suominen, who was introduced to the project after losing his wife and now lives alone. He said "My wife was the cook in the family. When you're alone you don't have the inspiration to cook so you buy ready meals, but it's not as good as home-cooked food. "It's amazing how enjoyable it is. You just concentrate on ordinary living and speaking to a real person. That's all you need and your evening is made." "It's amazing how enjoyable it is. You just concentrate on ordinary living and speaking to a real person." The charity, which runs its project in 19 out of 32 local authority areas in Scotland, already has around 100 student volunteers, but it wants to attract more young people. Emma Black, project manager for Meal Makers, said: "Real friendships are formed thanks to this project, which brings together different generations who love to cook and share food. "Older people who are experiencing social isolation appreciate receiving a freshly prepared meal and a friendly chat. "Volunteers tell us that they often cook more than they need and they're delighted to share their food with an elderly neighbour."